Grzegorz Barasiński is the founder of the School of Calligraphy, the author of the calligraphy handbook Copperplate, a propagator of beautiful writing and the owner of the Kaligraf company. He’s been working together with PromoNotes since 2017. How did your collaboration with PromoNotes begin? What is expected from a calligrapher and his work? What do you do at work/during trade fairs? During most events that we participated in, such as the Long Night of Museums, Cracovia Sacra or the Book Fair, we were handing out pieces of paper with calligraphed names and surnames. As for the reactions? The people said, “my surname’s never been written so pretty before!” So when someone asks me why did I pick up calligraphy, I answer: because of my love for beauty. People seek beauty, they want to commune with it and take possession of it. They ponder over important matters, they’d like to have prayers or quotations that are important to them posted on their walls, and so they ask to have them calligraphed. It’s amazing. Would you say that interest in calligraphy is currently undergoing a renaissance? 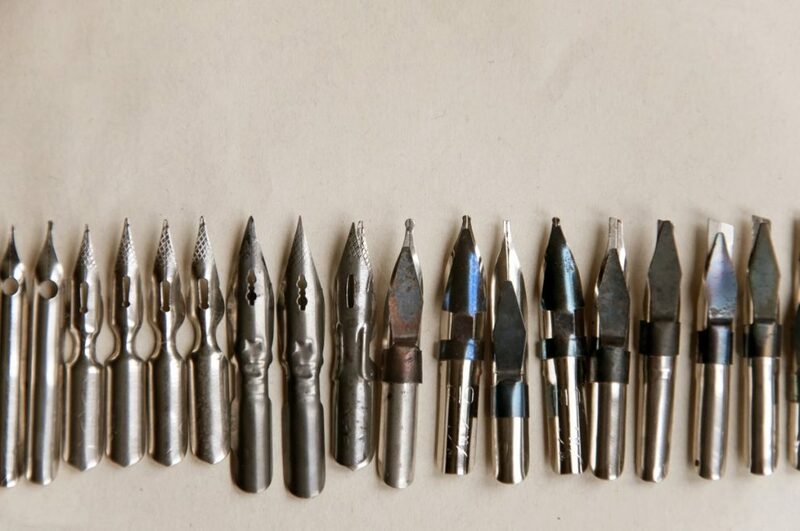 The interest in calligraphy is having a slow rebirth, and I feel that it’s related to one of the facets of modernity. Technology has entered our lives so thoroughly that from all our fingers we mostly use the thumbs, since these let us slide through images in our smartphones. As a result, some of us wish to break away, or run away, from that. We want all our fingers to function, we need other activities: felting, knitting, embroidering, etc.. People are going back to crafting, they wish to see the work of their own hands. Handwriting improves the functioning of the brain, it boosts concentration and memory. That’s what the scientists are saying, but we also know that handwriting is pleasant. We see the behaviour of our participants and how gladly they speak of their attendance at calligraphy classes. How did calligraphy enter your life? How did your approach to it change over the years? I started calligraphy during my religion studies course at university. It occurred to me back then that handwritten pieces of paper with a beautiful writing style could sell like hotcakes. But I quickly realised what’s really important – that people want to write in a beautiful style themselves. This belief led to holding the first calligraphy workshops for children, followed by further ones for adults, and so it’s been going on since then. At that time, I constantly trained myself in the art of calligraphy. I knew that this would be the only thing that I’d be dealing with, and that I’d devote my entire professional career to it. As a result, I became a teacher not of religious studies, but of calligraphy. What are the criteria for evaluating calligraphy? 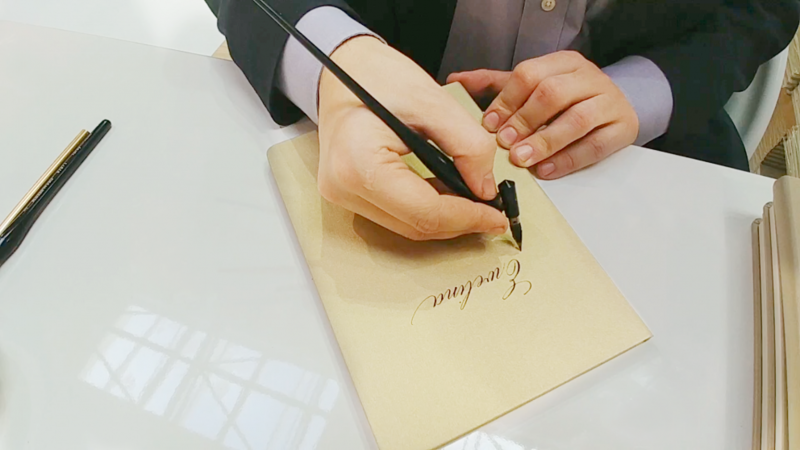 What do you expect from yourself as a calligrapher? I’d compare calligraphy to making music. You won’t play an entire concert after taking one short violin lesson. Similarly, you won’t calligraph an entire text after one class, with the right handling of the nib or the correct dynamics and shape of the letters. It needs time and must be practised. The first stage of learning calligraphy is like playing from the score. During our classes, we strive to give our students the ability to copy the source text in the most accurate way possible. To make them acquire enough diligence and perception as well as the awareness of what is in front of them. Only after reaching this level will they be able to improvise, and they will remain in harmony with their instrument (the pen). Calligraphy means working within a certain framework. Can calligraphy be practised anywhere? What’s in your suitcase when you travel to events with PromoNotes? When travelling, I take huge luggage and a well-supplied pencil box with me, since I have to be prepared for any circumstances. It includes a scalpel, a quill, a ruler, a bone folder, marker pens, fountain pens with various nibs, a few types of penholders and some other things. Some people joke that I’m a missionary of calligraphy, and so I carry this torch of calligraphic enlightenment. I’m also the first calligrapher for my children, whom I teach beautiful writing from the very start together with my wife. Thanks to my work, I visit various places – sometimes it’s Düsseldorf with PromoNotes, sometimes a small town or a country school. It’s something that I treasure greatly.